Update: Mr Lanza’s speech for candidates’ forum did detail various employment of the past, but no mention of working for WA Labor pollies? In the interests of ferreting out ALL the political parties/members currently targeting City of Canning council elections, today we take a look at Frank Lanza, running for Mason Ward. Frank, otherwise known as Franco, has used the ability to run under a common variant of his name for this election process. We don’t know why – Canning is a MAGNIFICIENT mix of cultures. It is a delight to see many representatives of our multicultural community running for office, as well as more women and a lot of young people. Last year WA Labor launched a new initiative “Council Connect”, which seeks to support members who are “committed to working through local govt to see the ideals, platform and policies of WA Labor applied and realised at local community level”. It appears… the Greens are coming out of the closet about the politicisation of local government in WA – and they’re dragging a few others out with them. Giz Watson [as Greens co-convenor revealed they] would have 11 candidates in council elections across Perth next month. While the major parties never own up to their involvement in local government, Watson belled the cat, saying it was well known Labor and the Liberals were active in encouraging members and supporters on to councils. Most recently the Liberals made a concerted effort to gain the numbers on local councils to push through the Government’s amalgamation agenda,” Watson told Post newspapers. “The ALP use local government as a training ground for State and Federal Parliament. The City of Vincent is just one obvious example.”…. there is no compulsion to reveal political affiliations in local government elections, although history suggests many ratepayers don’t like party interference at this level*. 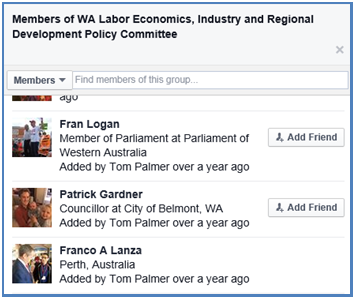 We aren’t saying Mr Lanza’s long term goal is to pre-select for WA Labor, but he would, of course, have joined the party as it would emulate his values which may not be representative of the Canning community overall. It should be noted that WA Labor did not repeatedly and fervently, publicly or in Parliament, demand democracy be returned to the people of Canning as soon as possible, but took the more electorally attractive route of jumping on the local govt reform backlash wagon. This didn’t change the fact that due to poor management of the reform process by former Commissioner Linton Reynolds, and current CEO Lyn Russell, our local govt area was due to be “ceased”. Only the last minute collapse of local govt reform saved Canning from that fate. We have also asked another candidate for Canning about possible WA Labor connections, and hope to update on that soon.